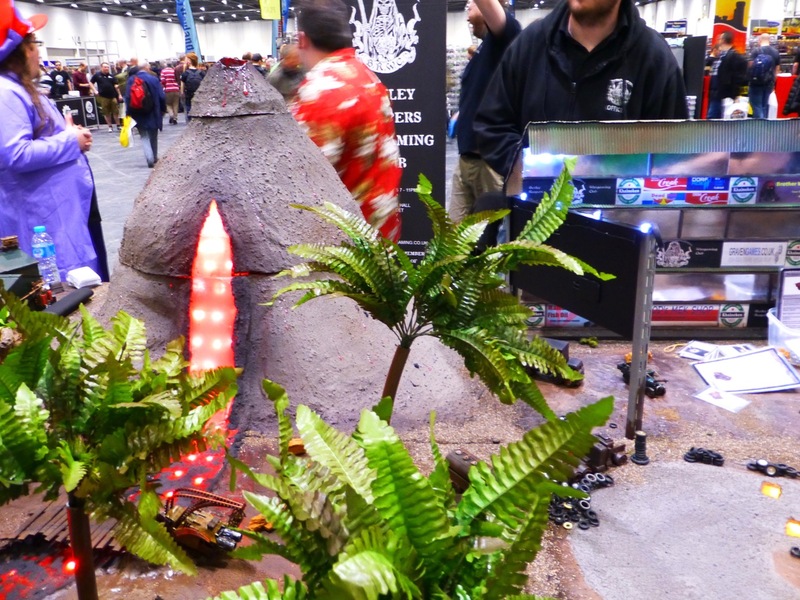 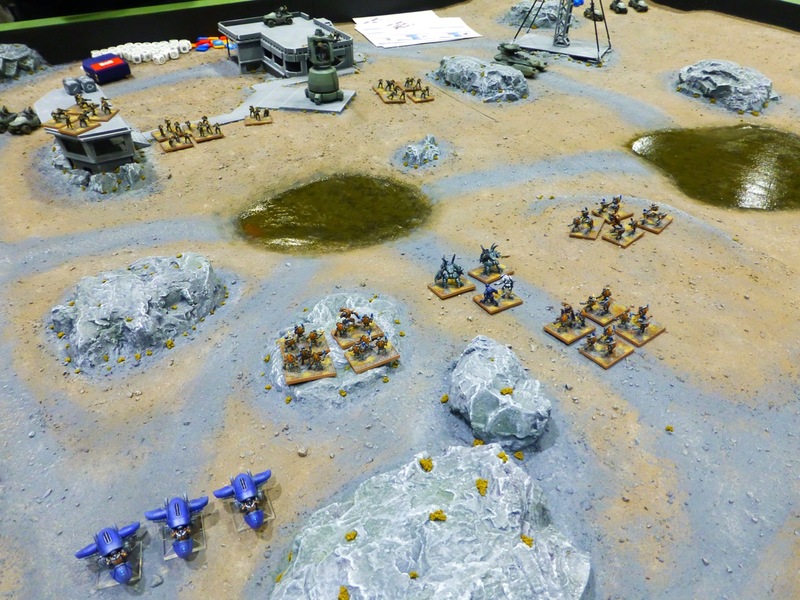 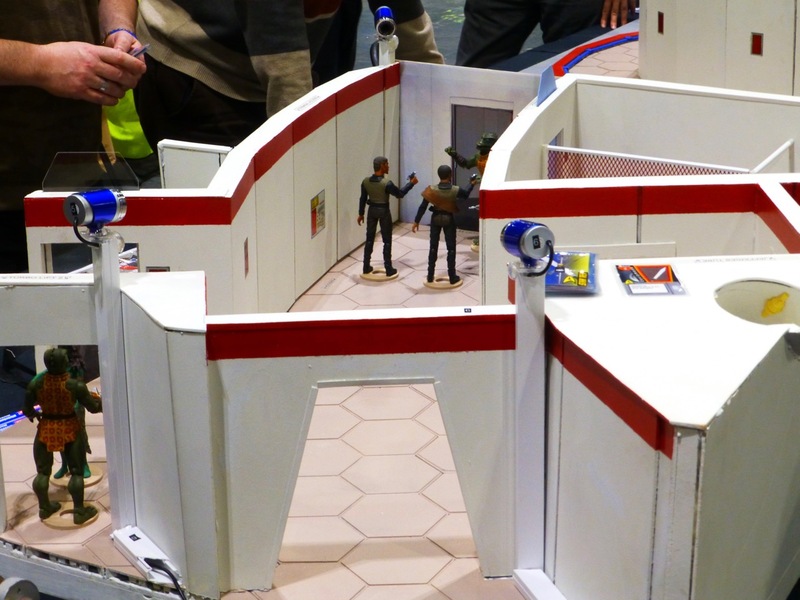 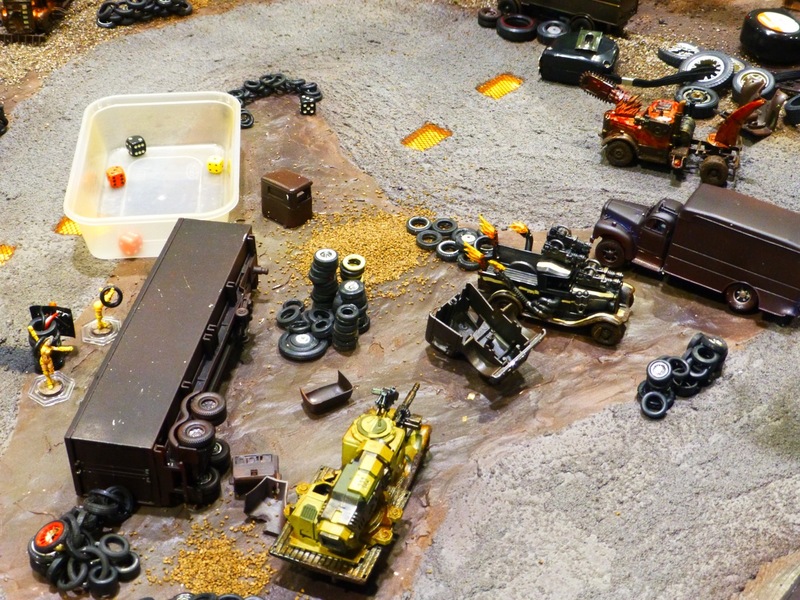 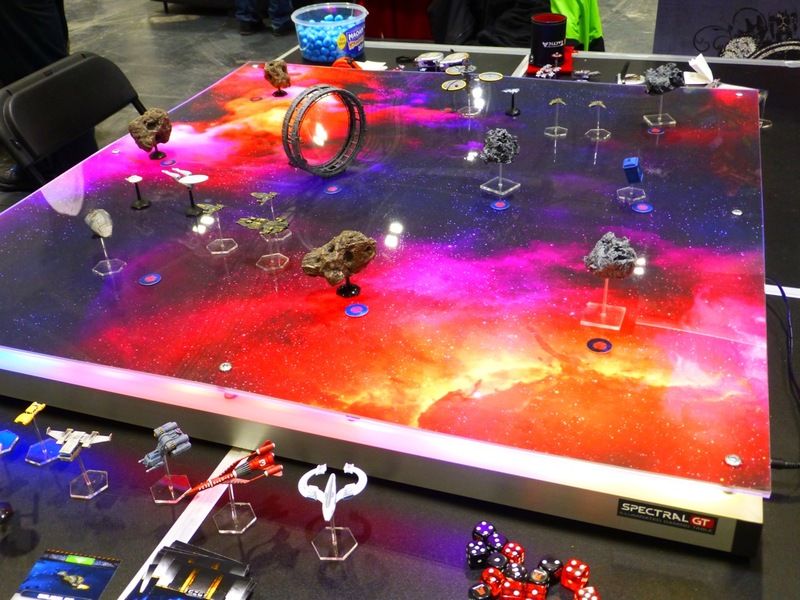 In the universe of Sci-Fi, space ship games were the most prominent theme at Salute 2016. 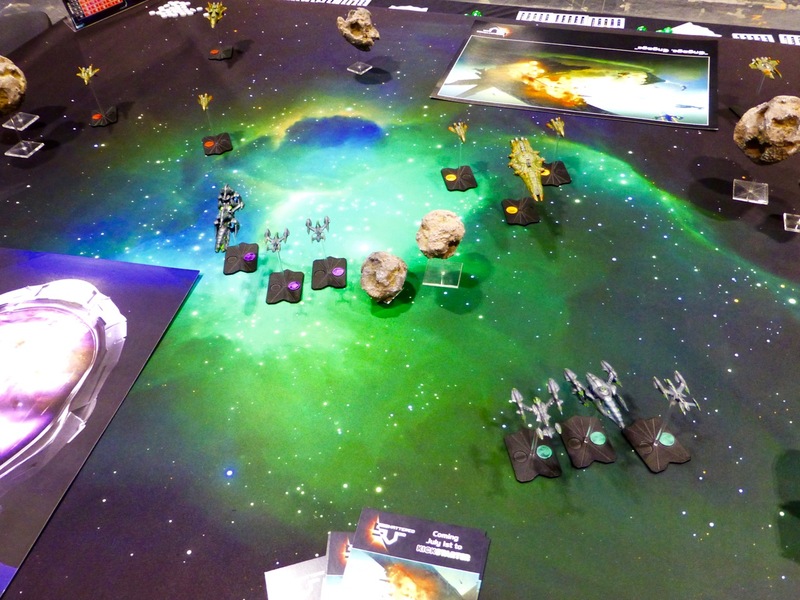 Since Battlefleet Gothic I haven’t played in this genre but now I’m very tempted to pick up one or two of these new games. 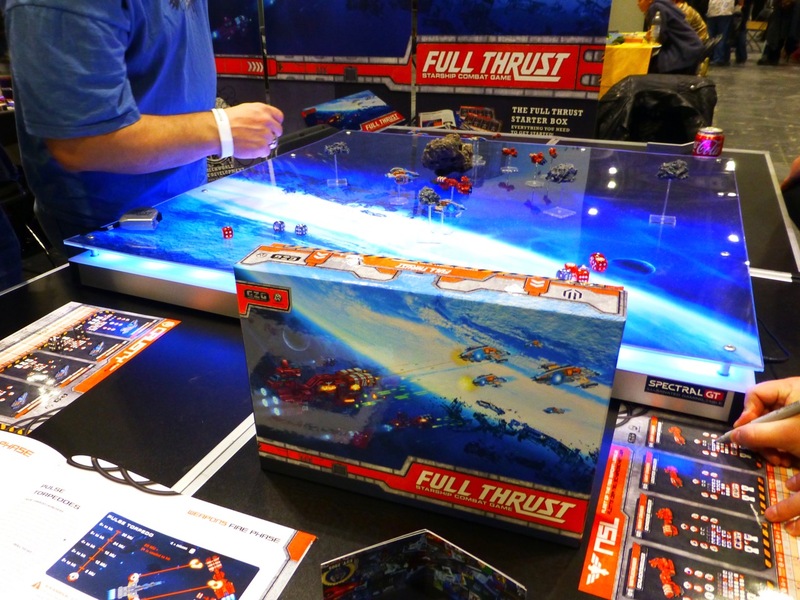 Mechworld ran the Full Thrust Academy on their illuminated concept gaming tables, showcasing their new starter set. 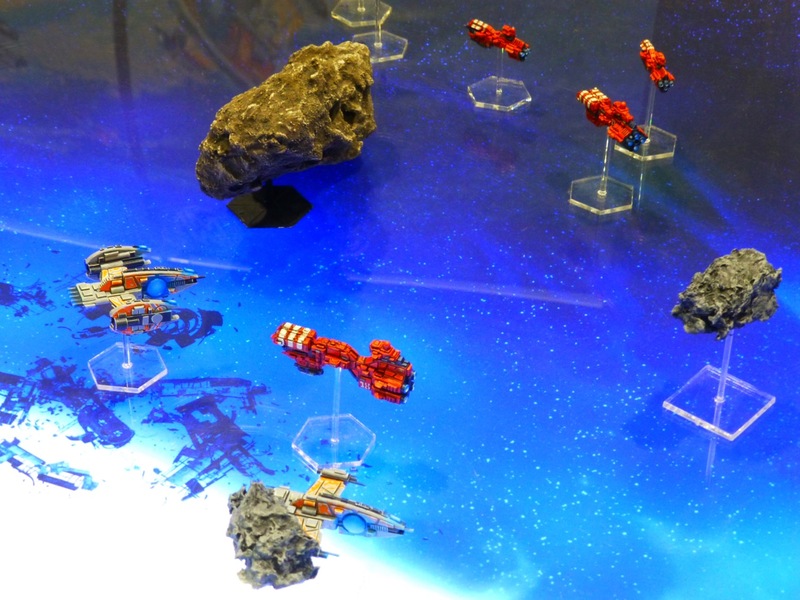 White Dragon Miniatures presented their upcoming Shattered Void game of space dog fighting which will be on Kickstarter in the summer. 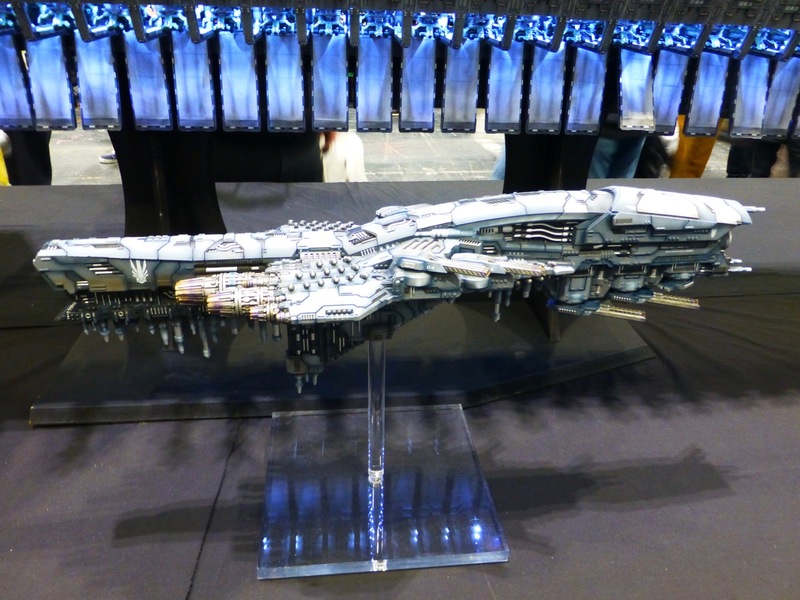 Dropfleet Commander already finished a very successful Kickstarter and Hawk Wargames showed off an upscaled 3D print of one of their ships. 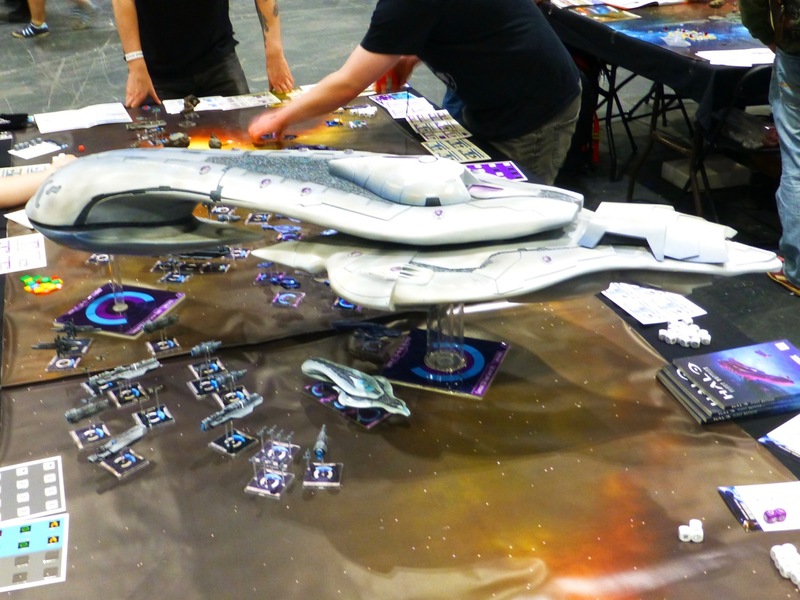 Halo: Fleet Battles from Spartan Games was played around a scaled up ship centrepiece. 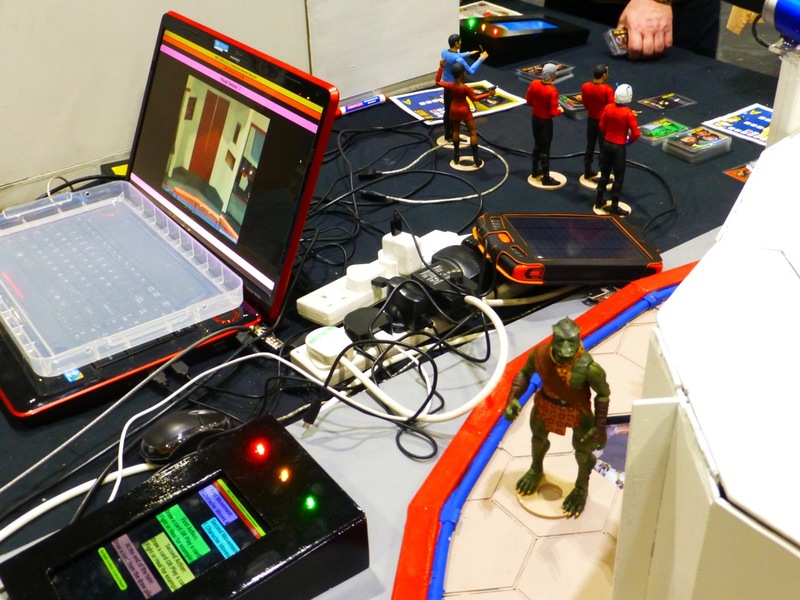 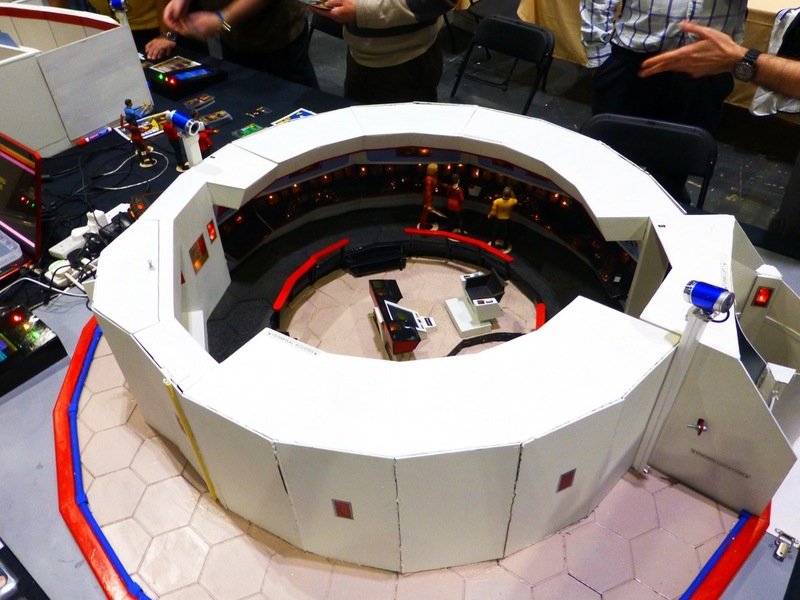 The South London Warlords had constructed a Star Trek participation game entitled Savage Dove, taking place along the corridors and bridge of the Enterprise and being broadcast through a set of webcams. 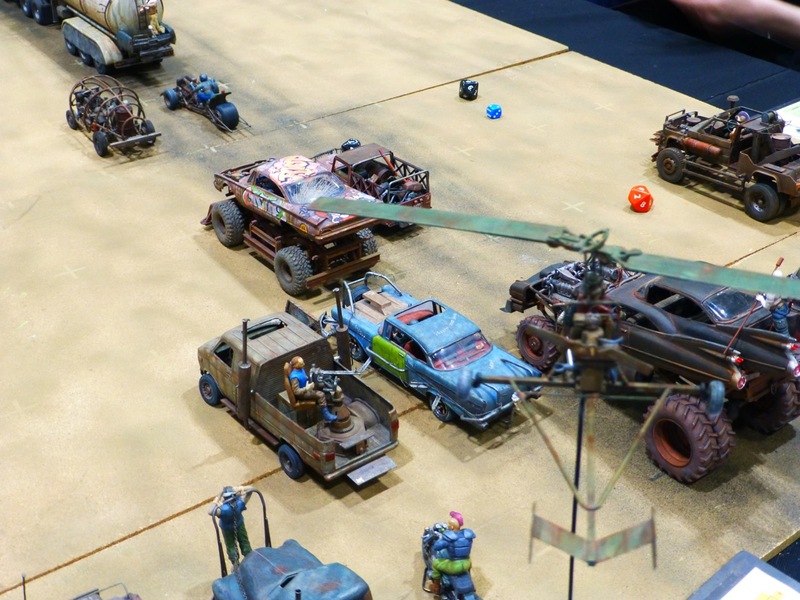 The Sheffield Runelords tried to Stop the Truck in this sequence from Mad Max 2. 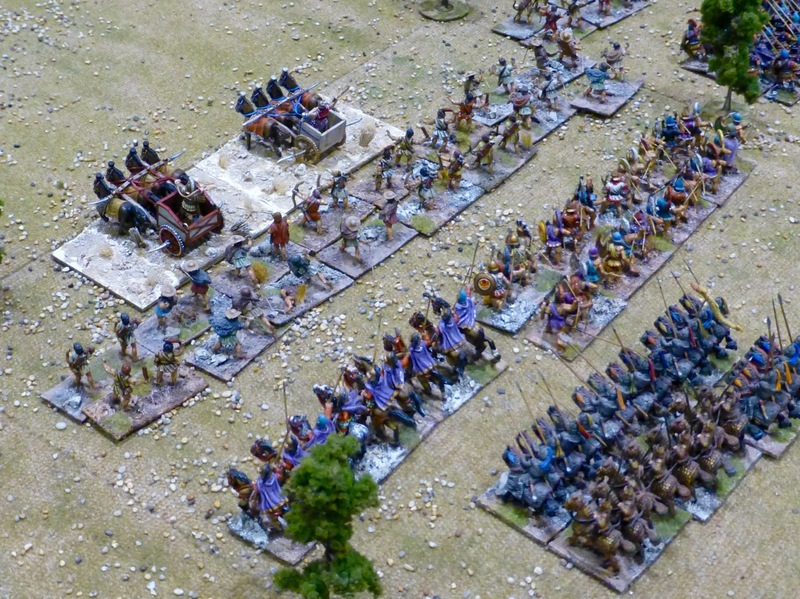 More vehicular mayhem ensued in the Battle of Mount Maerzan by Bexley Reapers Wargaming Club. 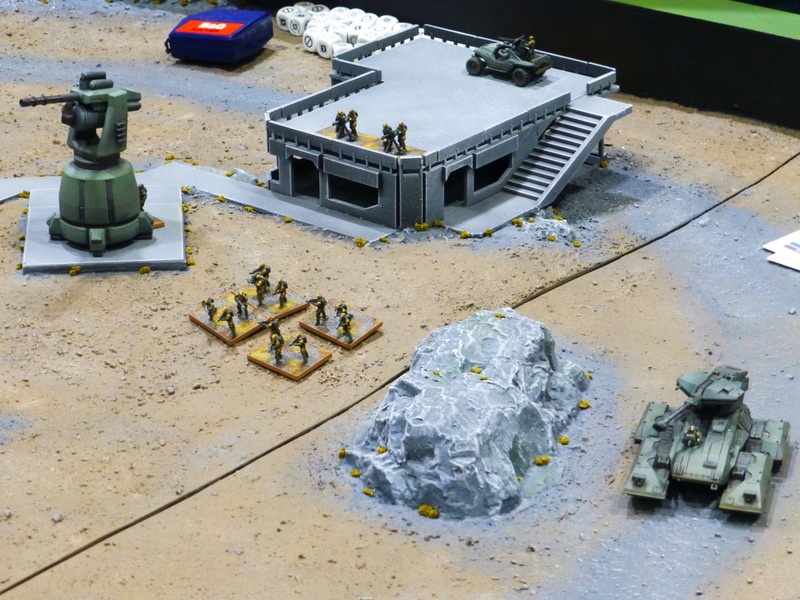 Another offering from Spartan Games with Halo: Ground Command in 1:100 scale. 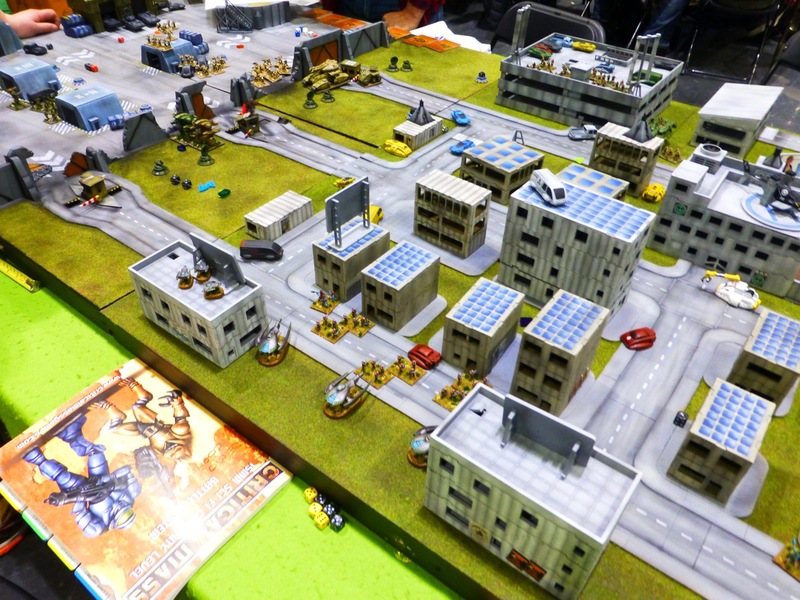 More futuristic 15mm battles were fought in this cityscape for Critical Mass. 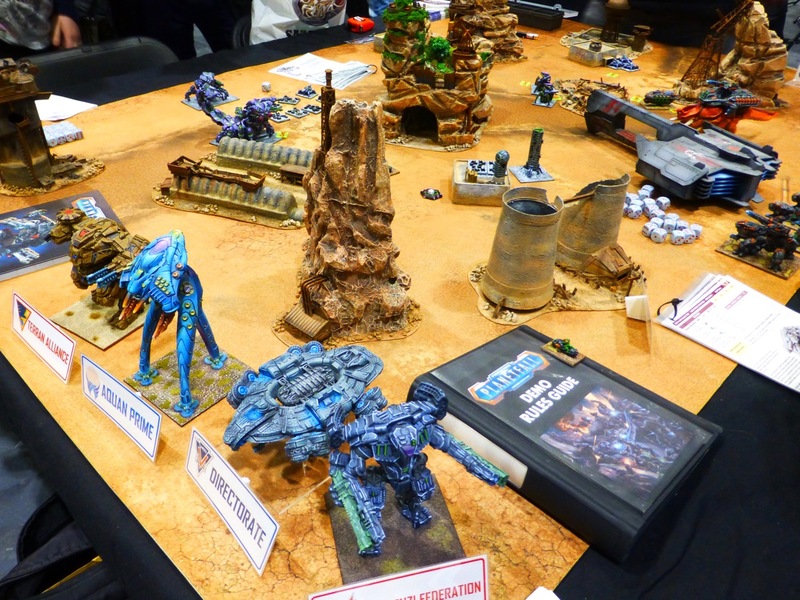 For Planetfall set in its Firestorm Galaxy, Spartan Games ran demo games and had brought scaled up engines of war representing the various factions. 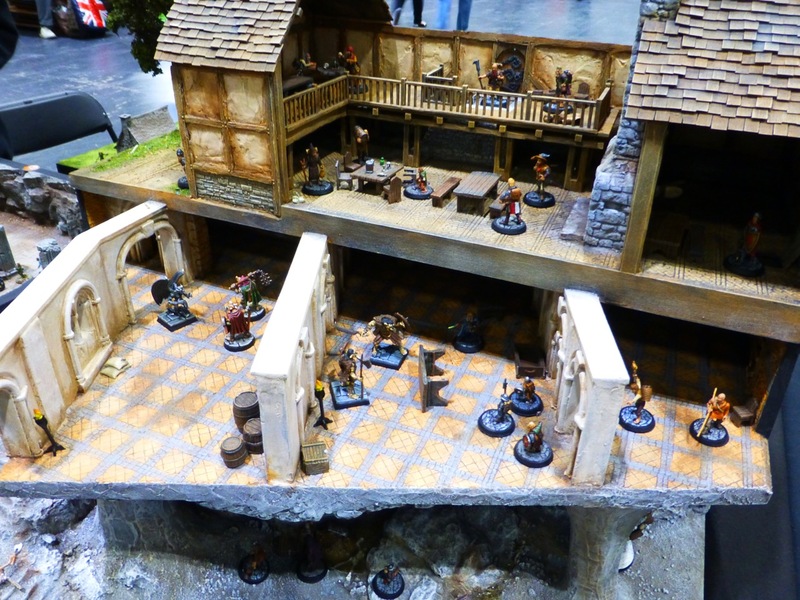 In the world of Fantasy most tables at Salute 2016 were run by manufacturers demoing their products and games. 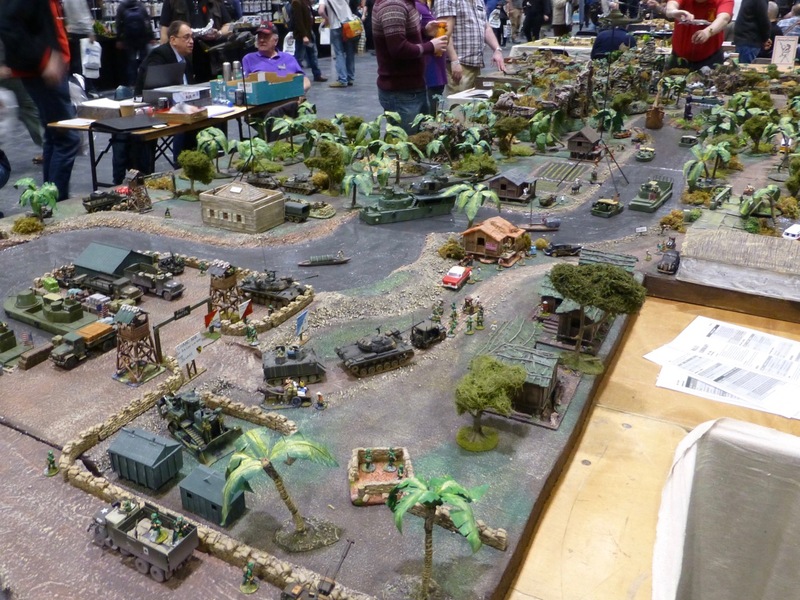 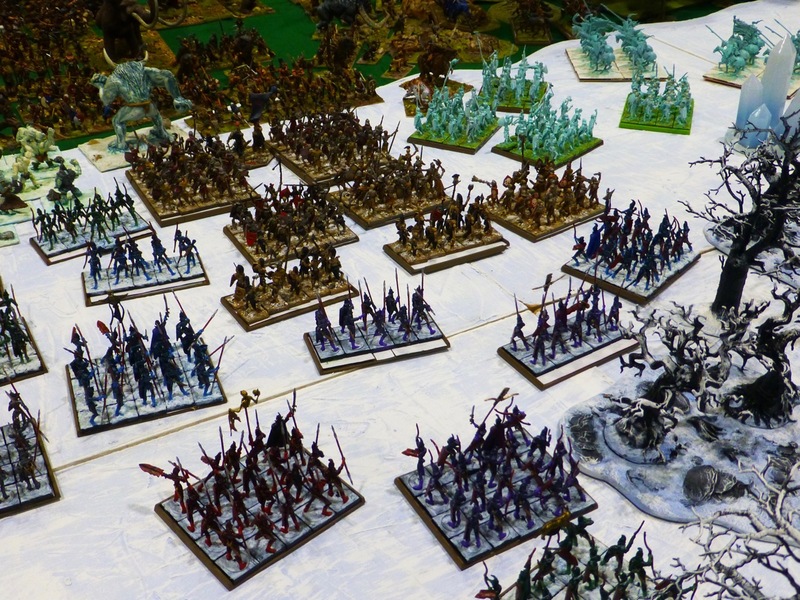 An exception was this massive table heaving with miniatures brought together by the Ilford Wargames Group. 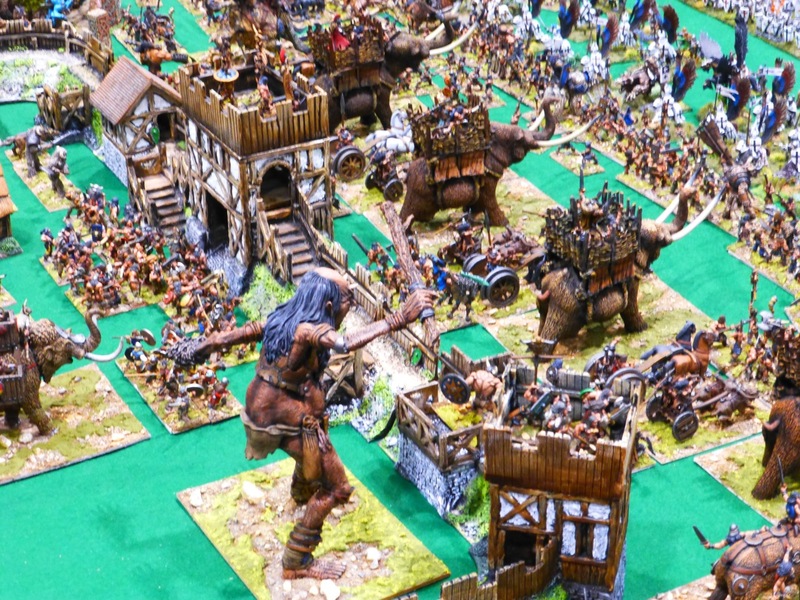 The Fall of the Life Goddess witnessed a titanic clash between the forces of Good and Evil, using a wide variety of fantasy races and sculpts from Citadel Tomb Kings to Grenadier Barbarians. 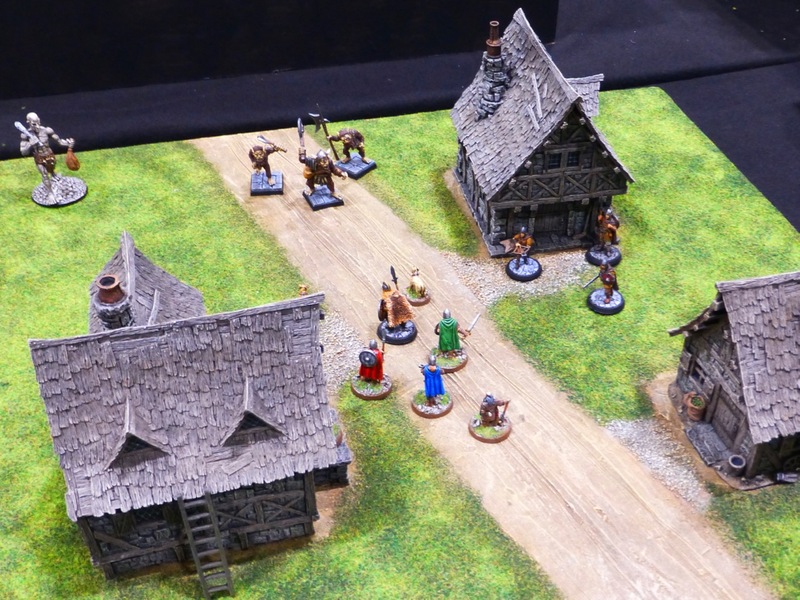 On the other end of the spectrum, Otherworld Miniatures ran skirmish level encounters with their range of classic D&D inspired figures. 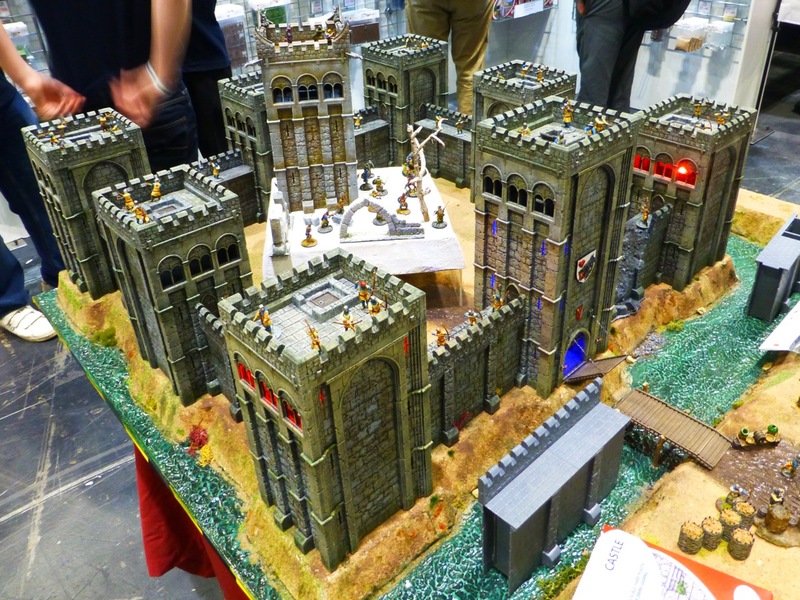 Renedra built this display table with their new plastic castle set. 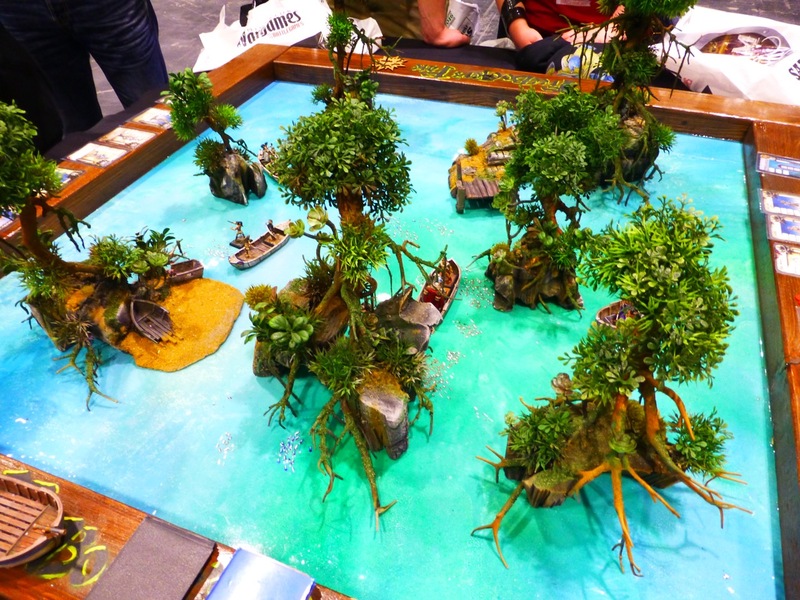 For Freebooter’s Fate this demo table in a sunny lagoon made great use of aquarium plants. 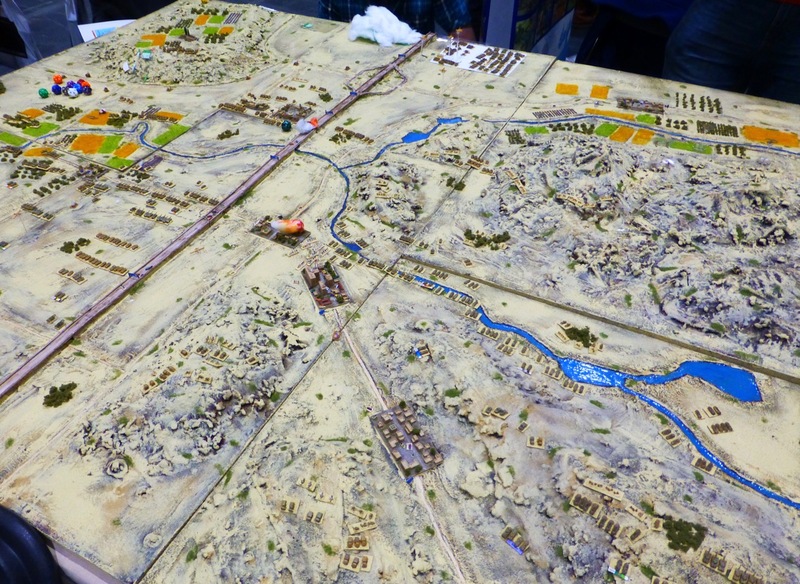 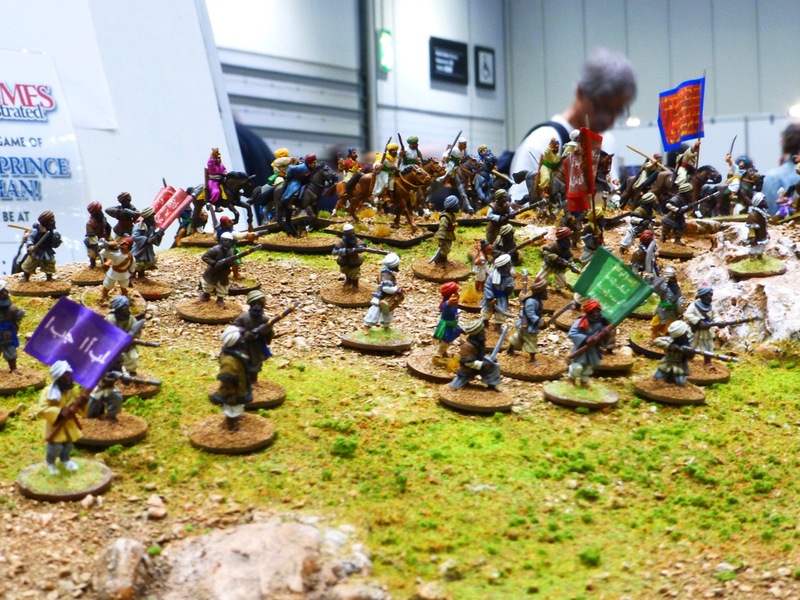 The most strikingly colourful wargaming tables at Salute usually feature battles from the 16th to 19th centuries, with their massed ranks of brightly uniformed infantry waving massive banners. 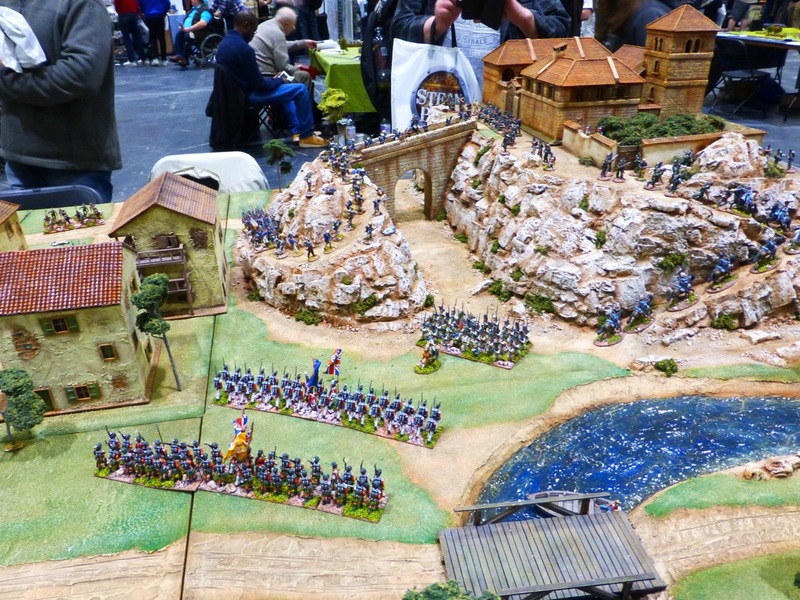 The hobbyists dedicated to those periods also seem to have a particularly obsessive dedication to their craft and come up with the most beautiful terrain and characterful diorama pieces as part of the raging battles which are a joy to discover. 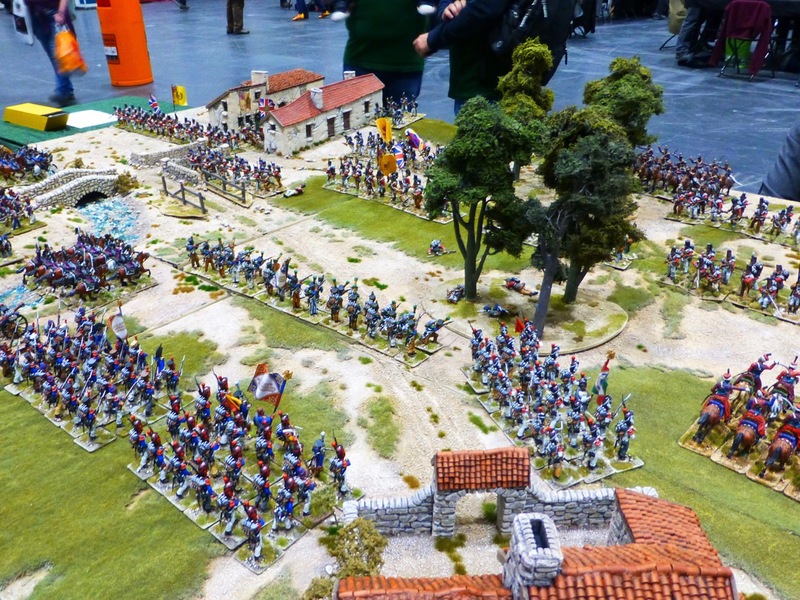 In terms of categorising all of these I’m always struggling so this time I’m bundling everything from the First English Civil War through Napoleonic and Victorian up to the Mexican Revolution into a single post. 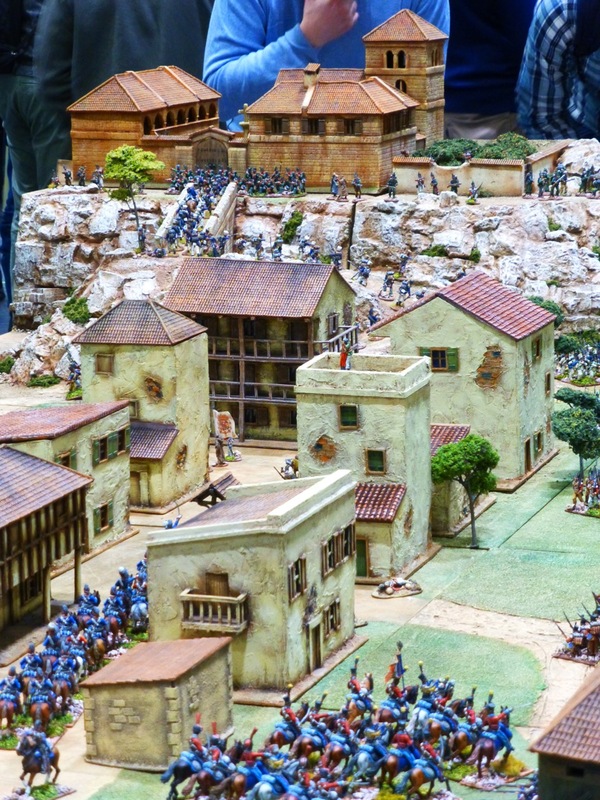 My apologies if this upsets your historical sensibilities. 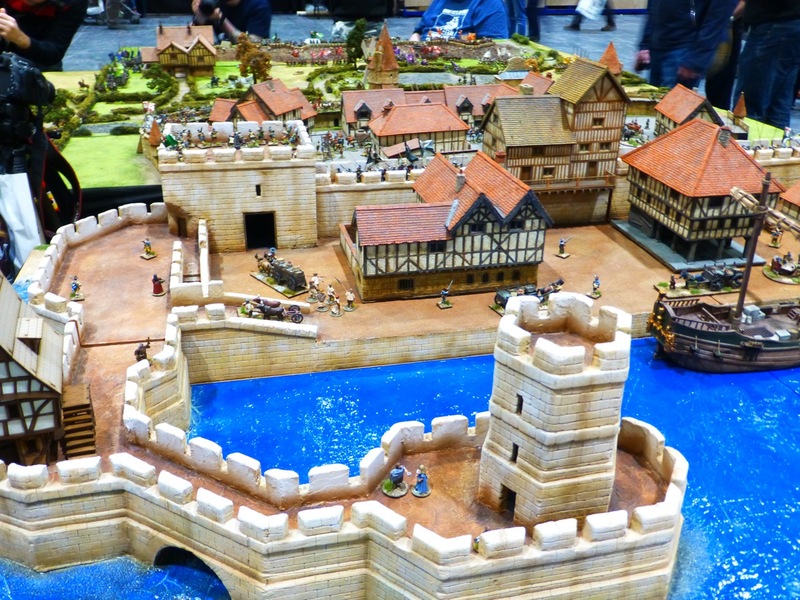 First up is the Bloody Siege of Bristol in 1643 during the First English Civil War by the Crewe & Nantwich Wargames Club. 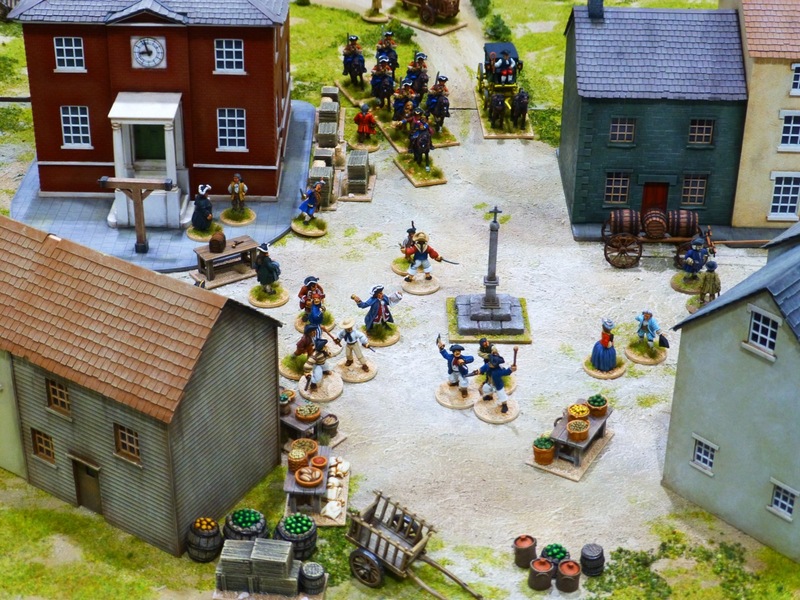 Oshiro Model Terrain delighted us this year with the Adventures of Paul Drake, an 18th century smuggler trying to get his way against redcoats and revenue men. 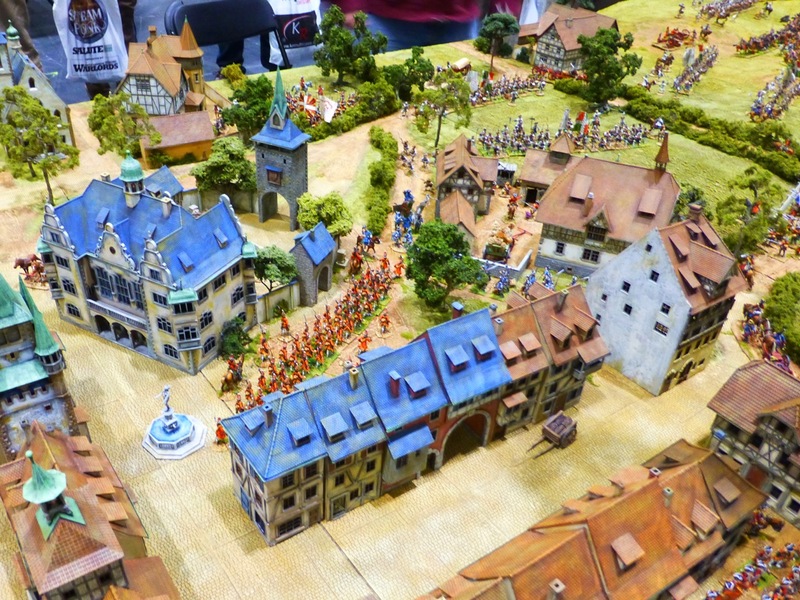 Bill Gaskin and friends staged the Battle of Wilhelmstadt during the Seven Years War on a stunning table stretching from open countryside to the city itself. 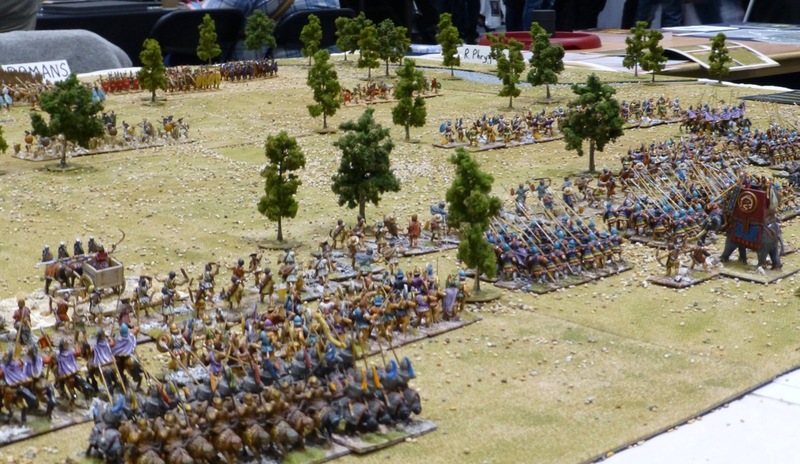 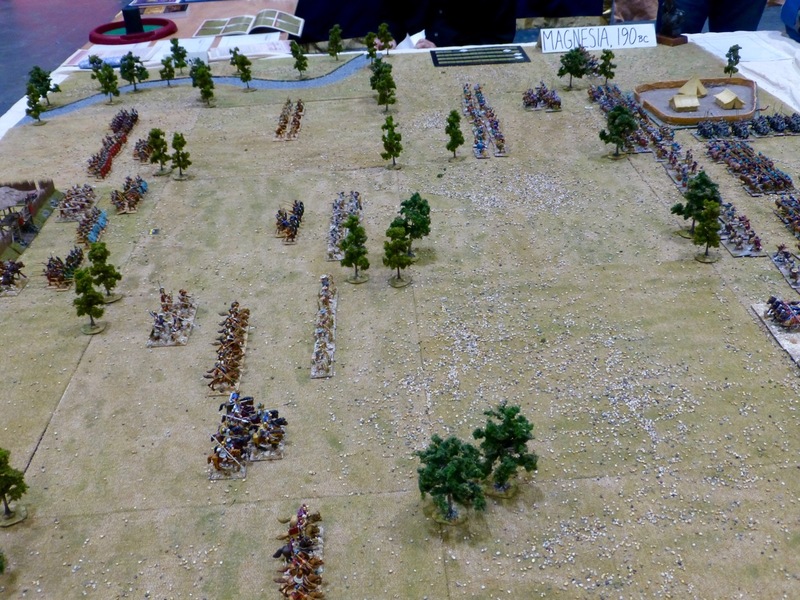 Victrix used their 54mm Napoleonic range in a participation scenario entitled Spain 1800. 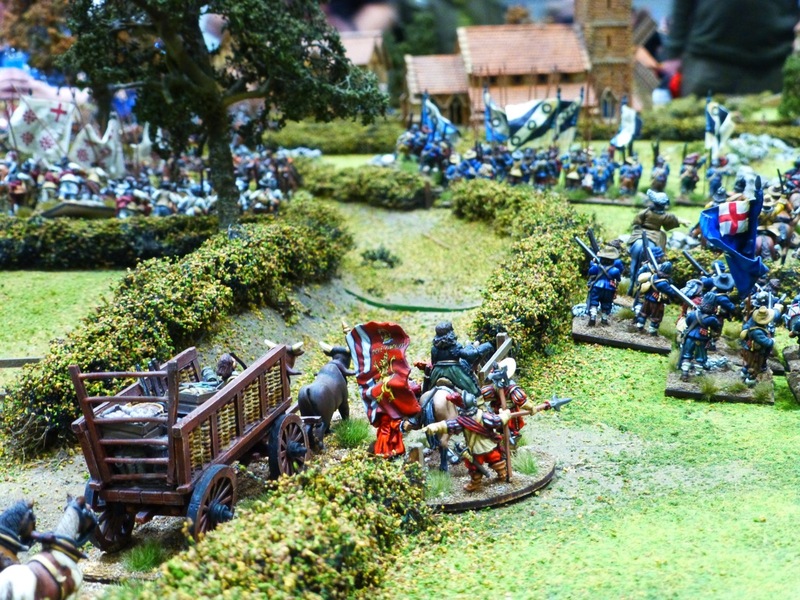 Ian Smith and friends brought the 40mm scale Battle of Adrados based on the novel Sharpe’s Enemy. 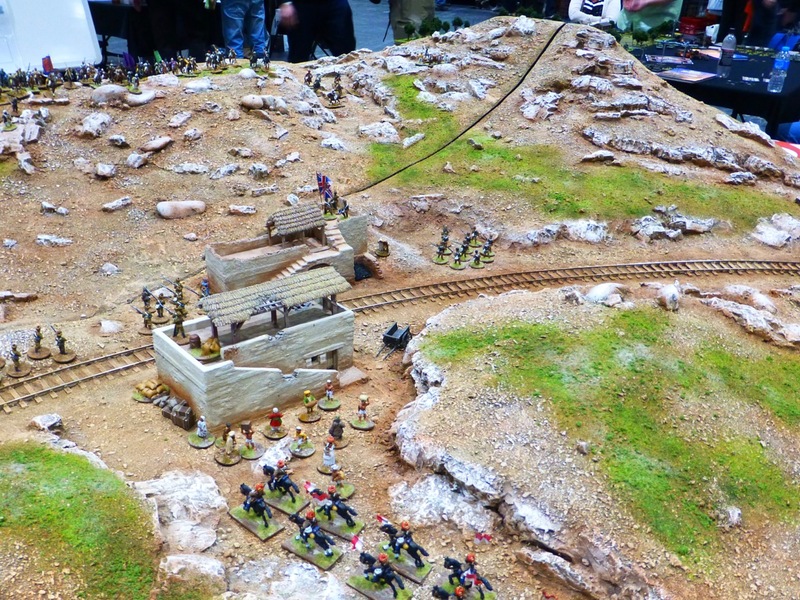 The Sons of Simon de Montfort created a table for The North West Frontier to play out a tale of high adventure involving mounted tribesmen, a steam train and a prince. 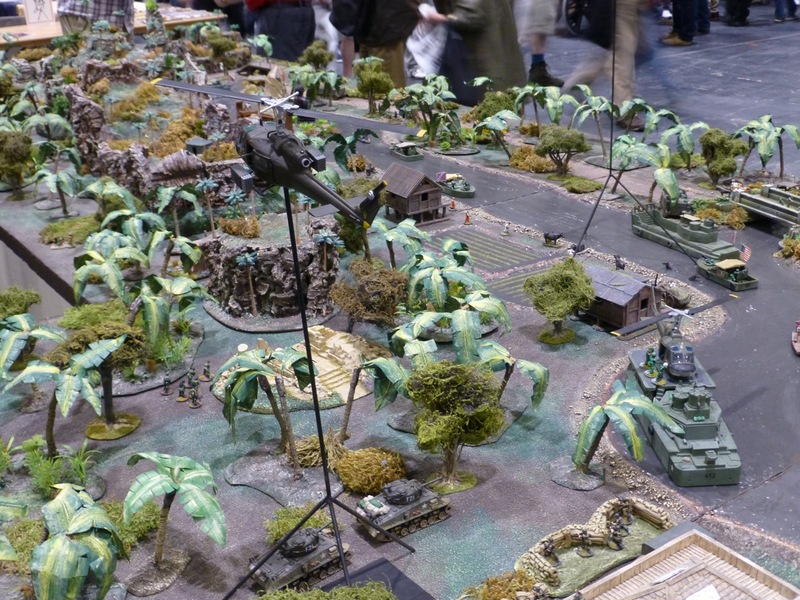 Wargames Foundry had set up a table for the Congo during colonial times. 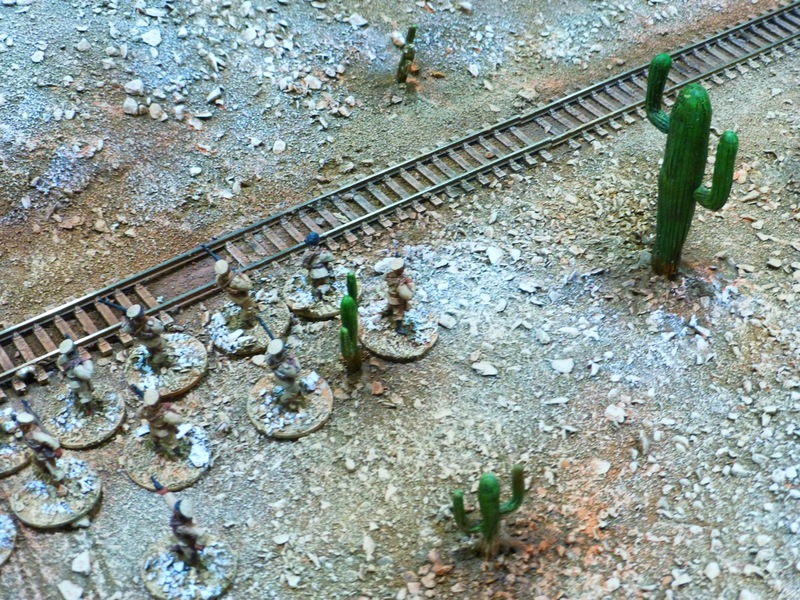 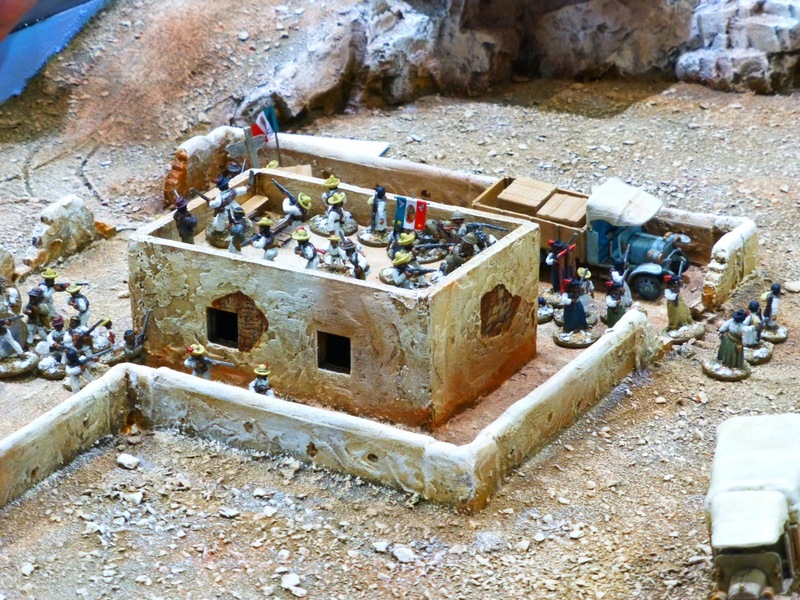 The Mexican Revolution in 20mm scale was the theme of this table. 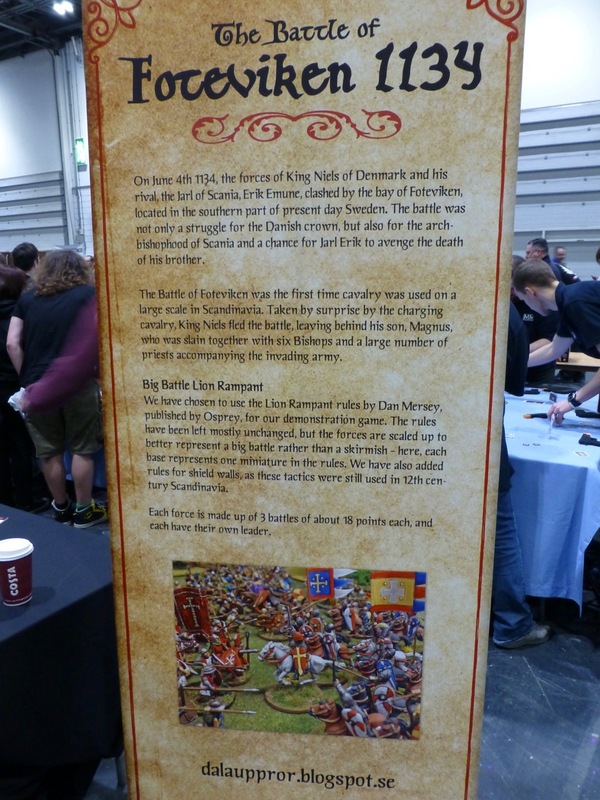 It wasn’t included in the show guide unfortunately, but according to knowledgeable sources it’s a participation game by GDWS which will also feature at Claymore. 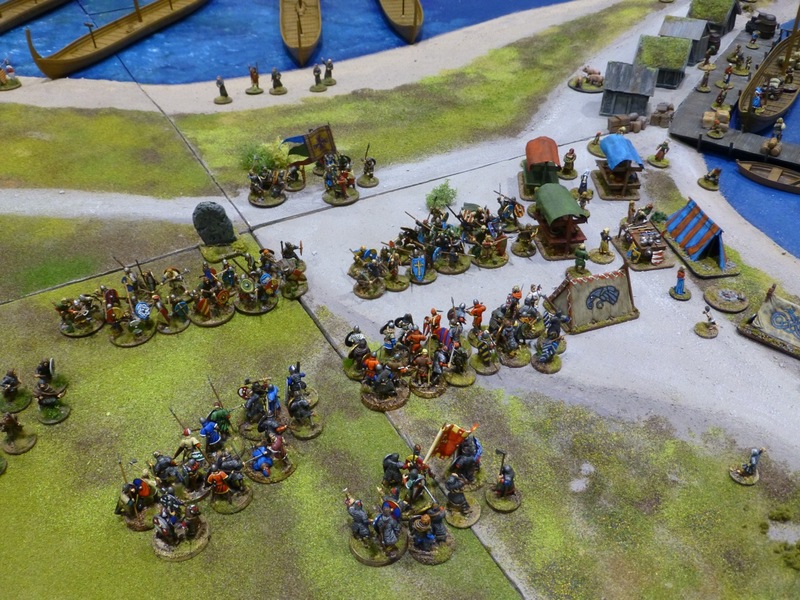 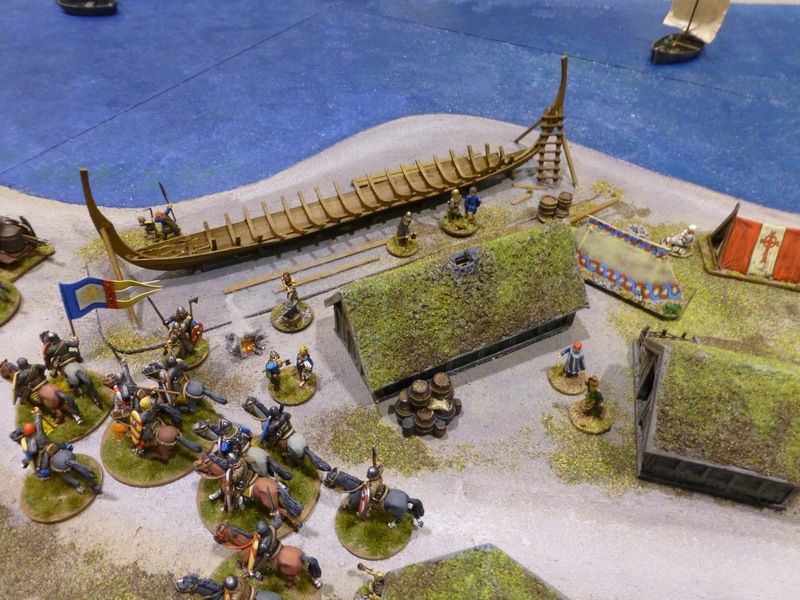 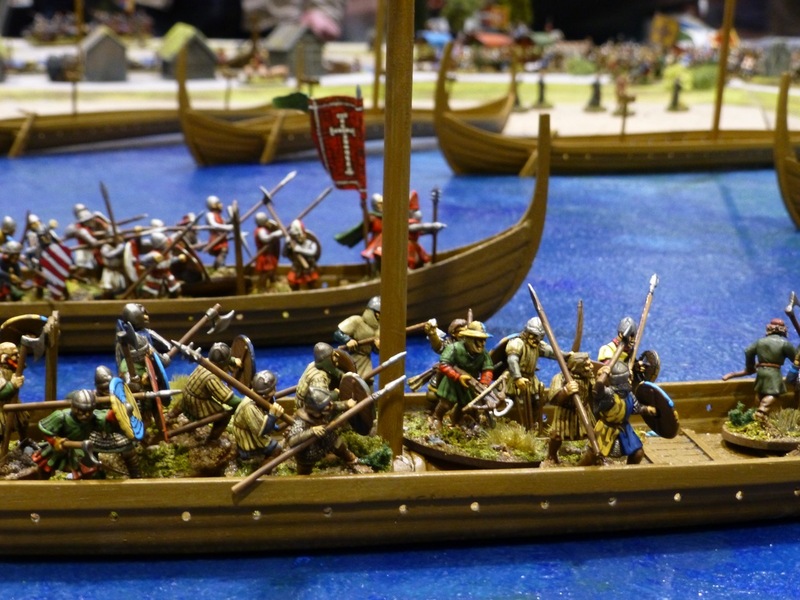 For the Ancient and Medieval eras less caught my eye at Salute 2016 than in previous years, but amongst those was my favourite of the show – The Battle of Foteviken 1134 by Dalauppror. 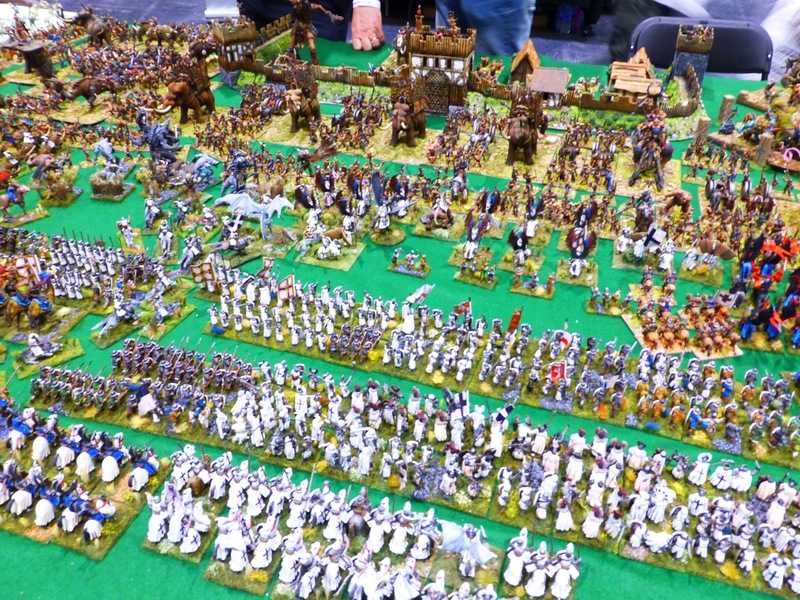 A lot more photos on their own site, so I suggest you head over. 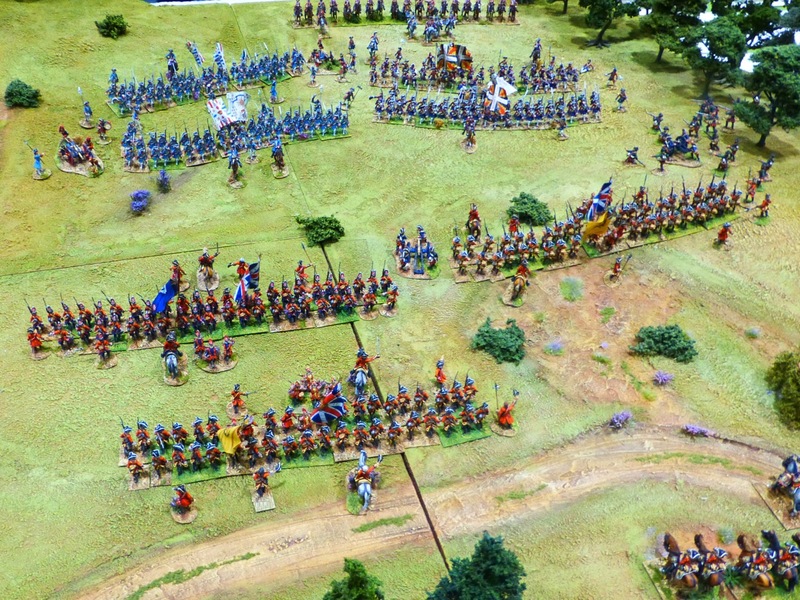 The Battle of Magnesia 190 BC by the Society of Ancients was played out using the Lost Battle rules. 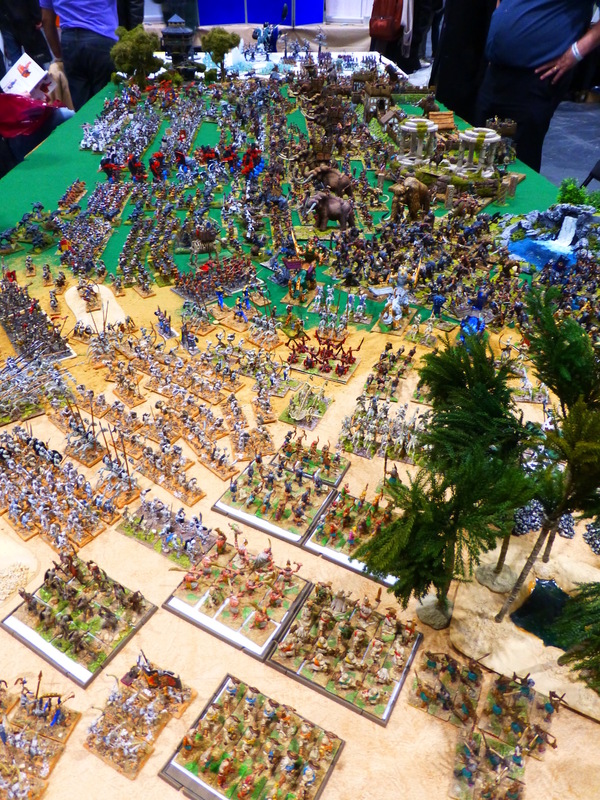 Wonderful armies for my favourite period in history, unfortunately I didn’t manage to return to the table later to take more detail shots. 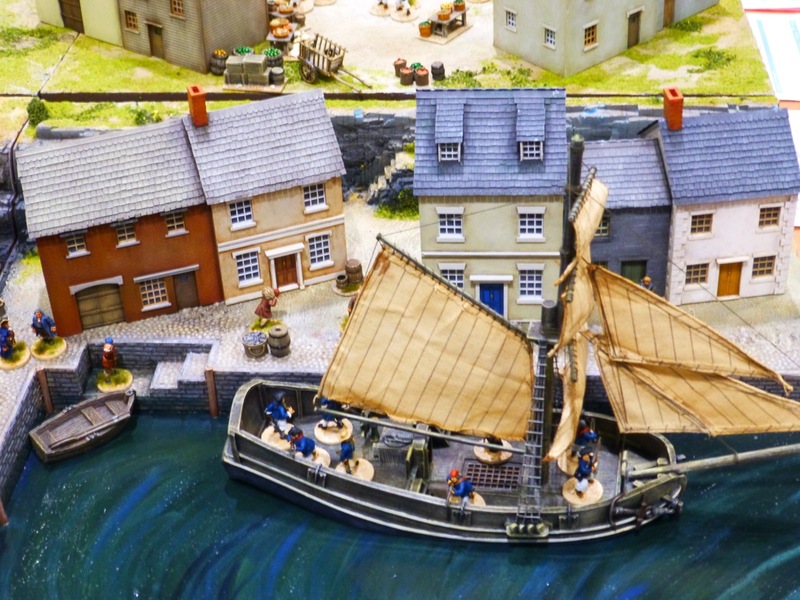 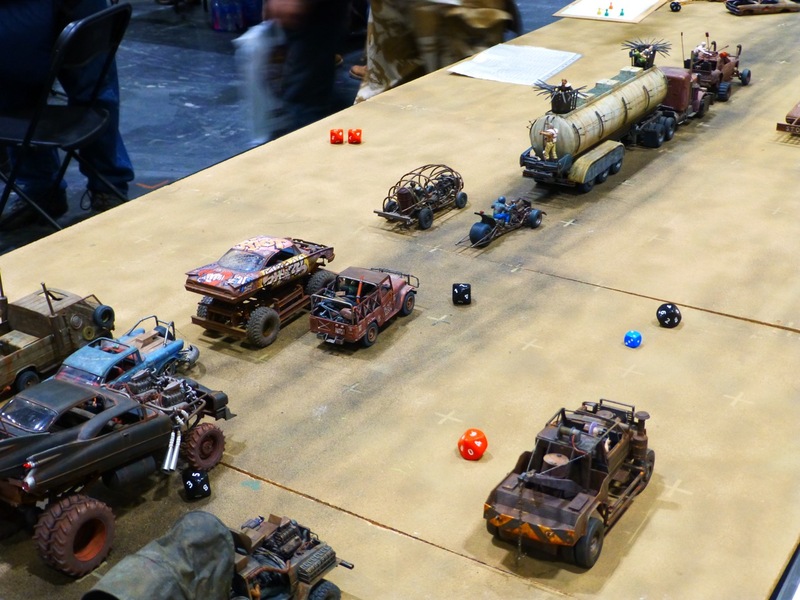 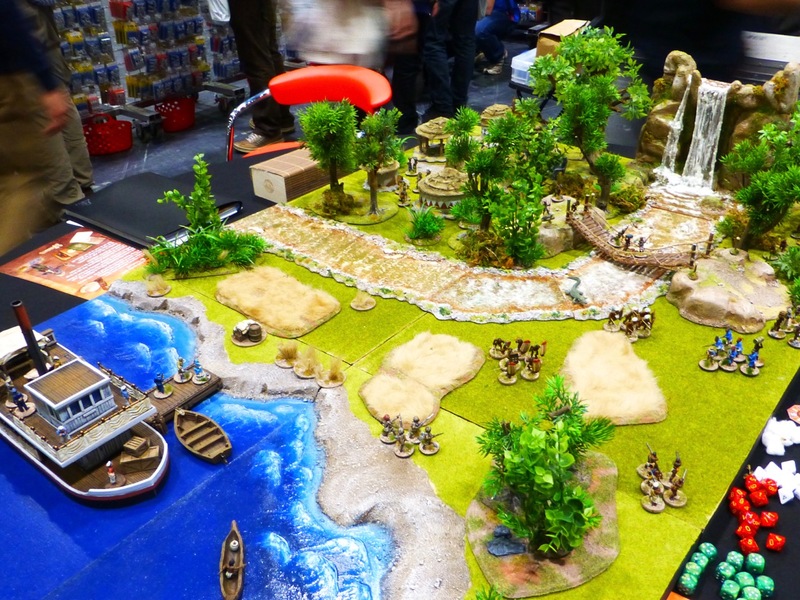 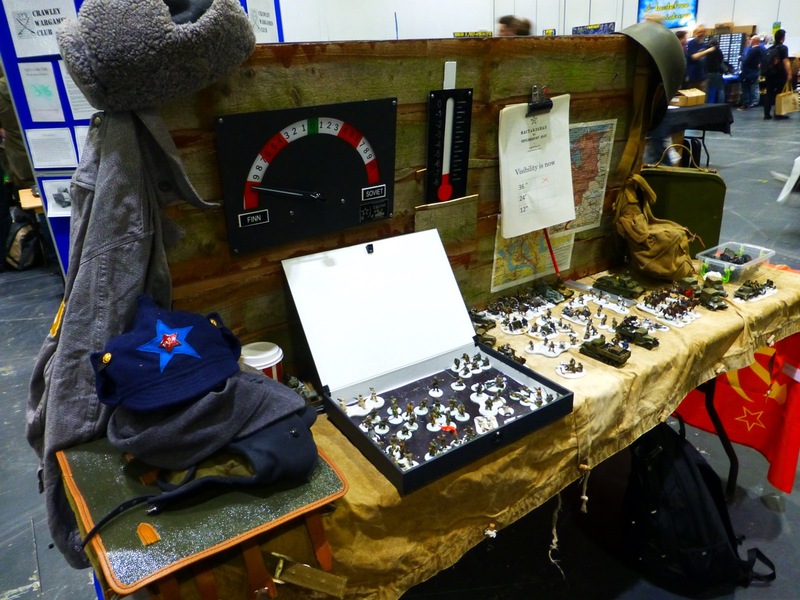 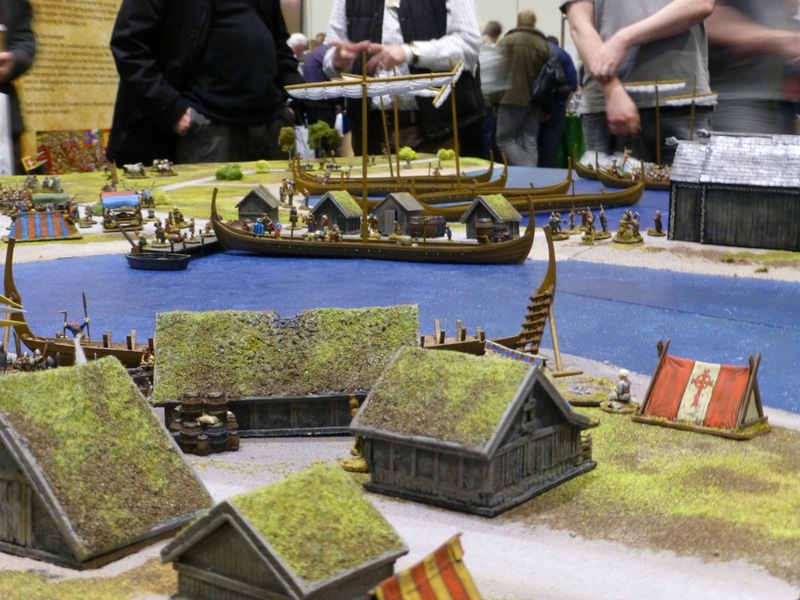 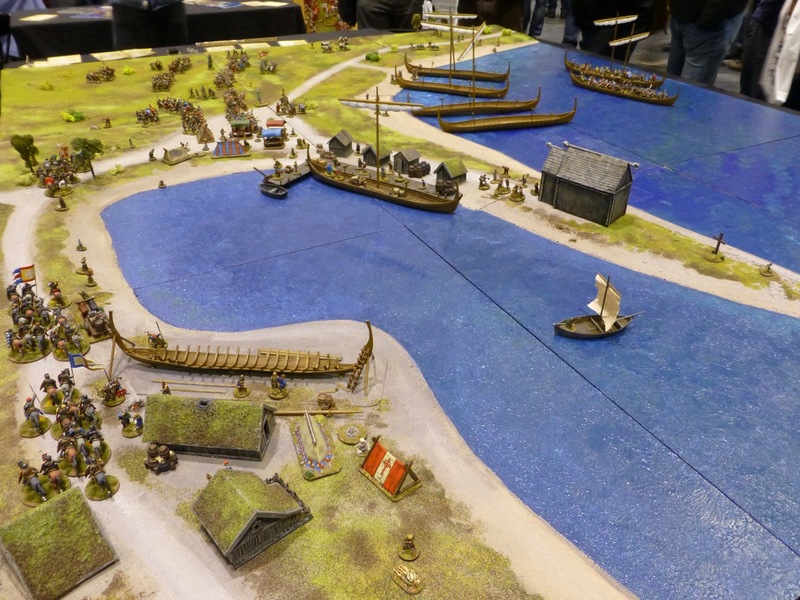 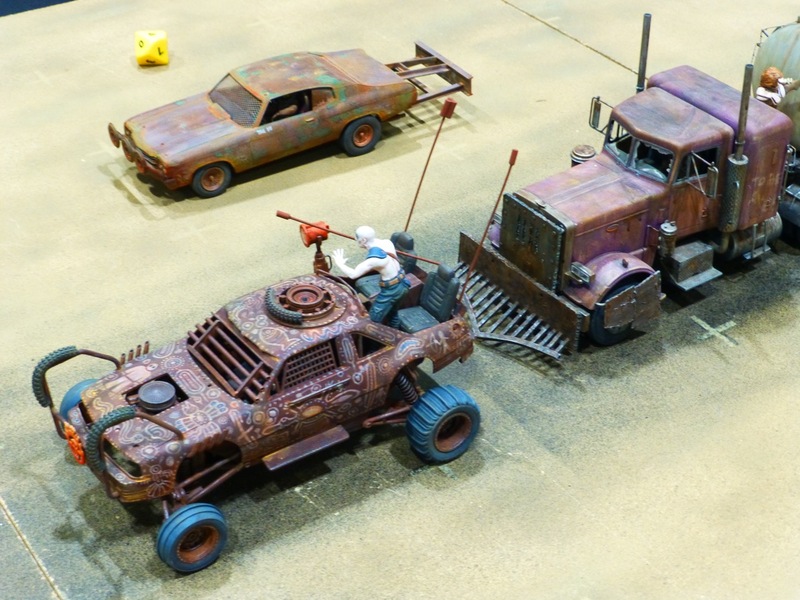 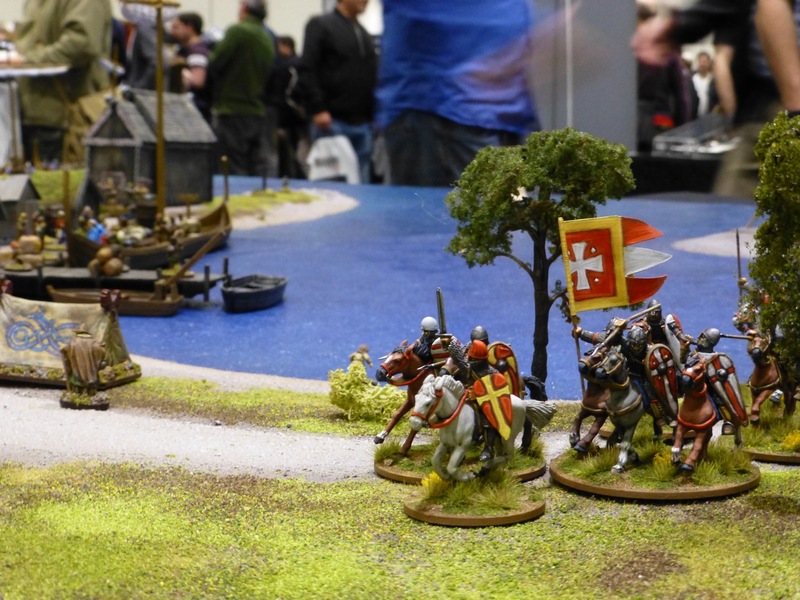 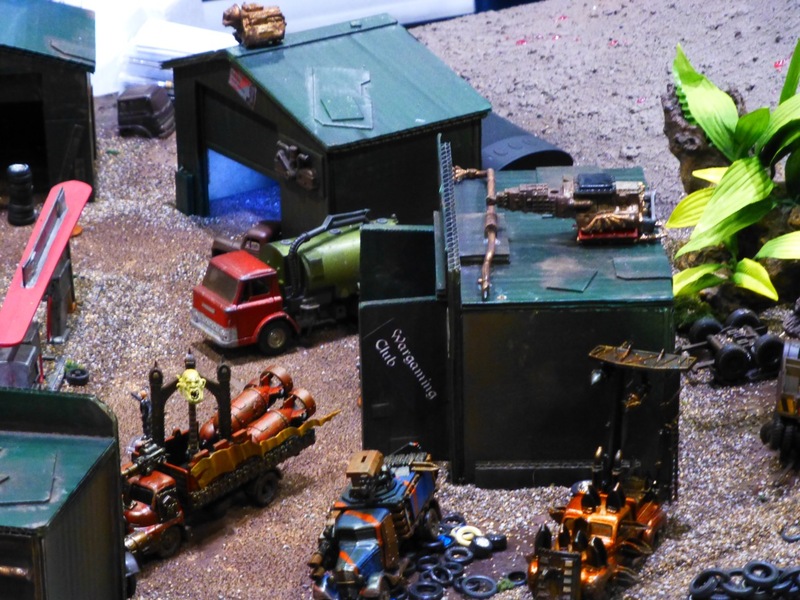 Salute 2016 at the ExCeL organised by the South London Warlords brought its usual variety of wargaming across many eras and scales. 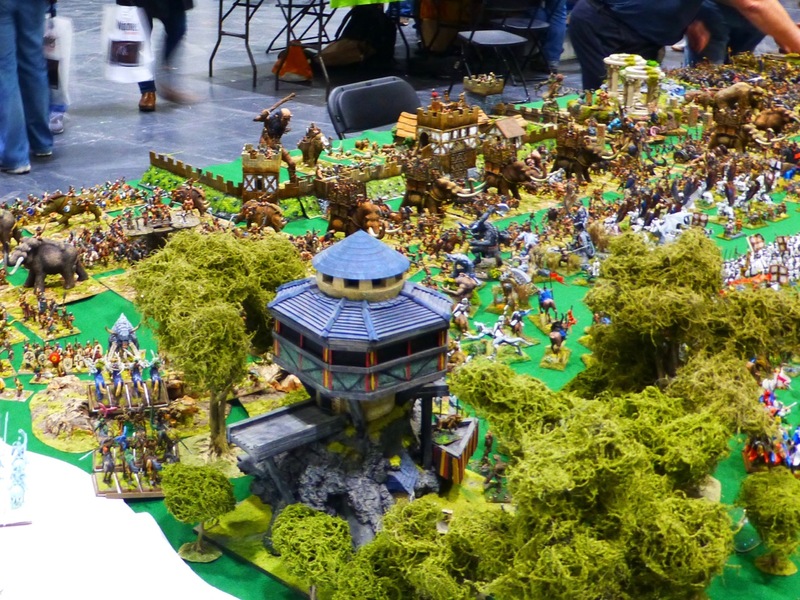 Getting to see all the amazing tables in-between browsing and shopping is always a challenge. 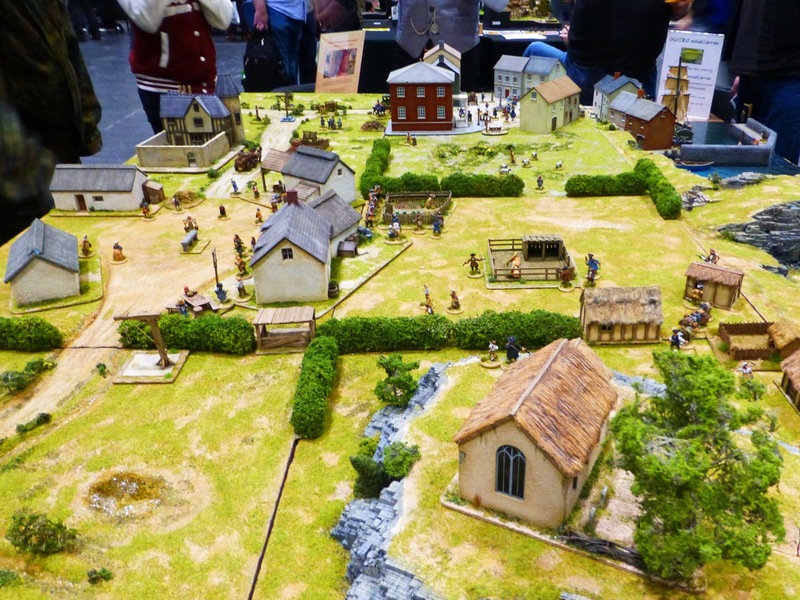 At the end of the day I managed to snap at least a selection to provide an overview of what was on display, starting off with the historical late modern era. 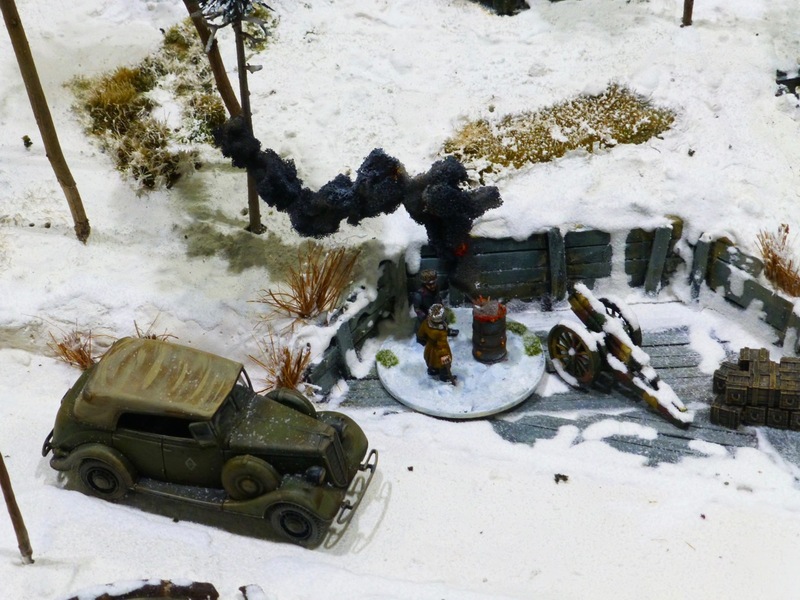 The Loughton Strike Force put on a battle during the Russo-Finnish War of 1940 over a frozen lake using the Chain of Command rules. 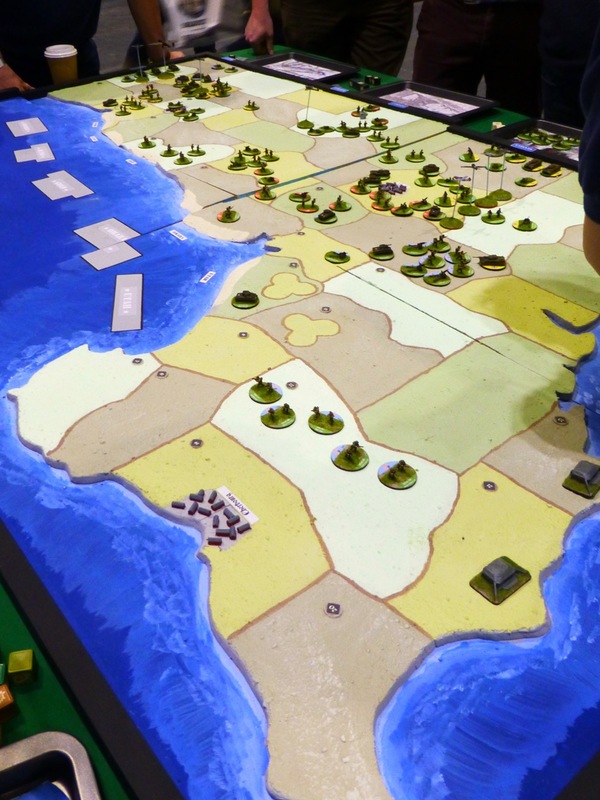 The Tet Offensive was the backdrop to the Essex Gamester’s Vietnam War mega game. 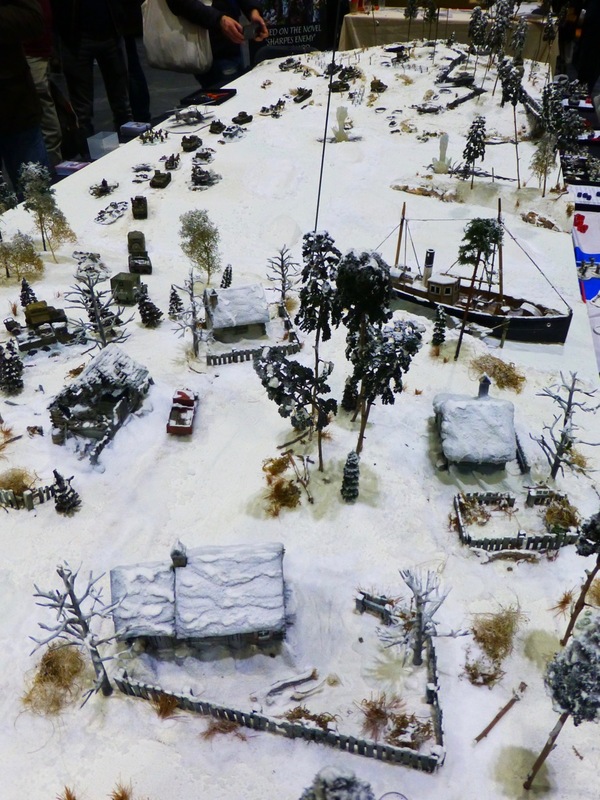 Cold War gone hot in 6mm scale was the topic for Heroic and Ros’ 1986 Gyros Teller Goes Small in a Large Way which saw Soviet forces assault across a river defended by NATO. 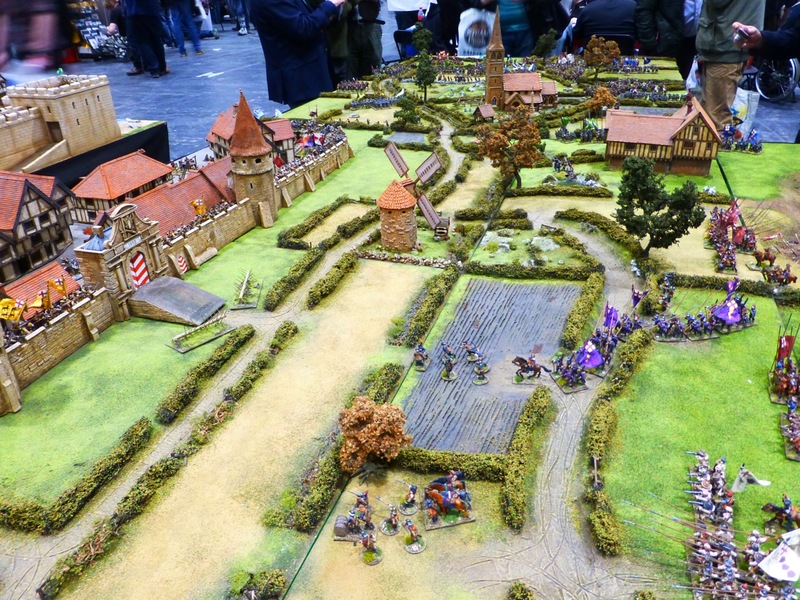 Leicester Phat Cats were gaming in the same era using Team Yankee rules and 15mm models. 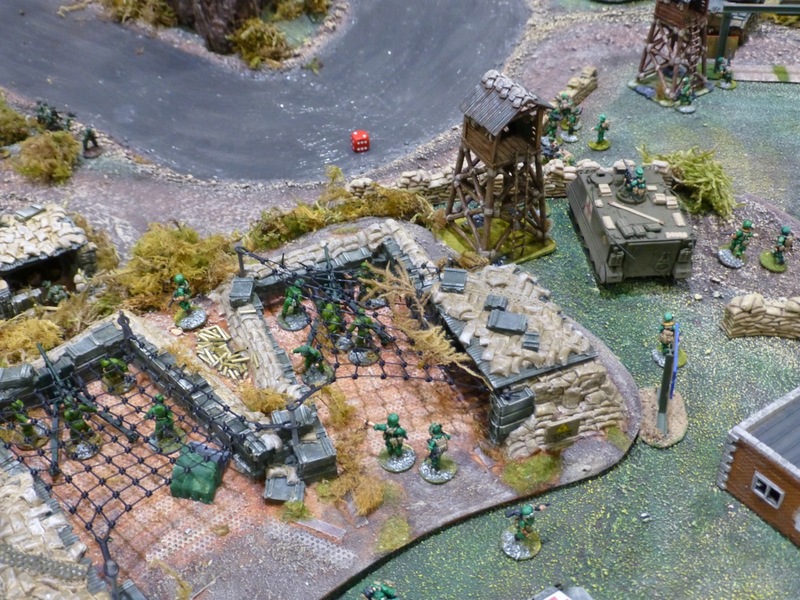 The setting saw a US Combat Team face off against a Russian Motor Rifle Regiment. 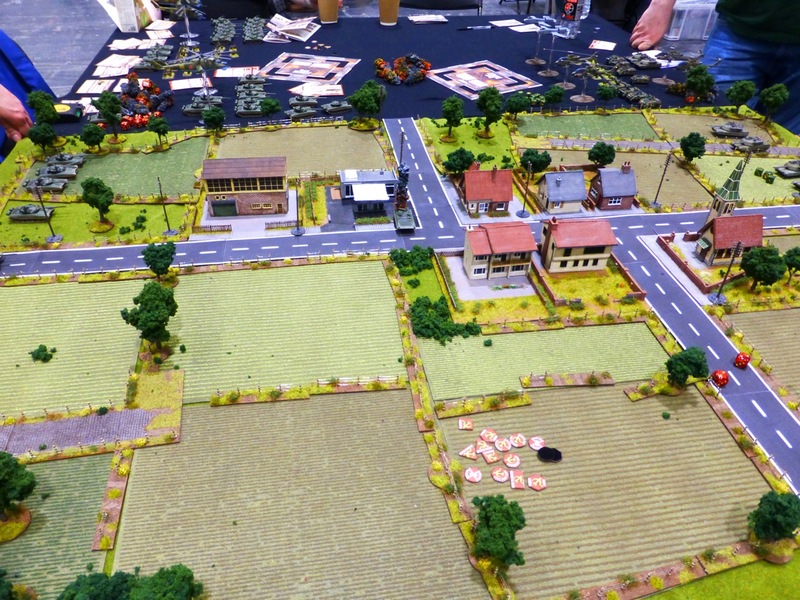 Jet Warfare of the 1980s was the theme for White Hart Wargamers’ Sidewinder game. 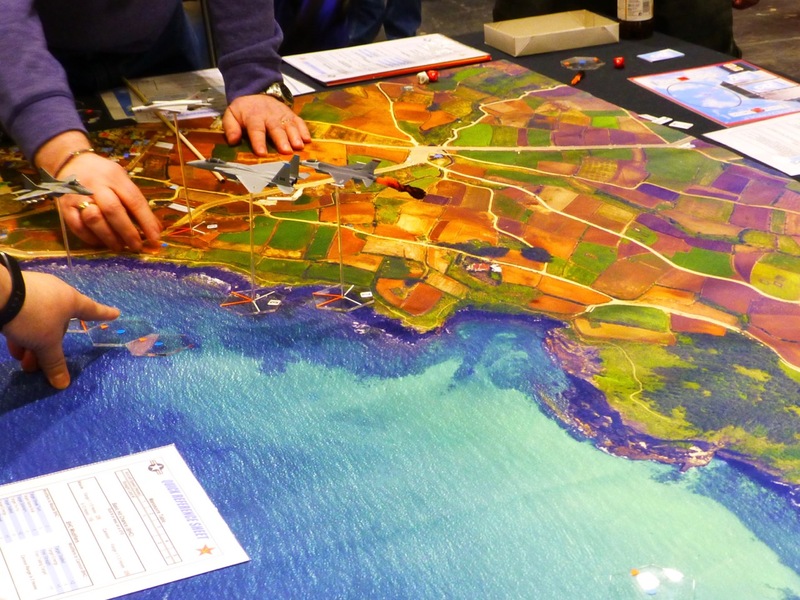 The Crawley Wargames Club hosted the D-Day: Operation Overlord participation game. 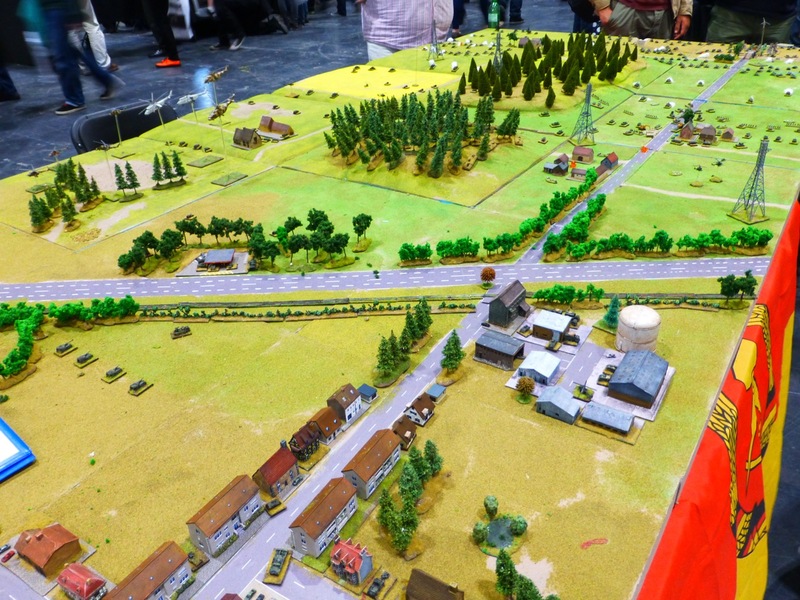 The Road to Homs was the title of an alternative scenario for the Invasion of Lebanon 1982. 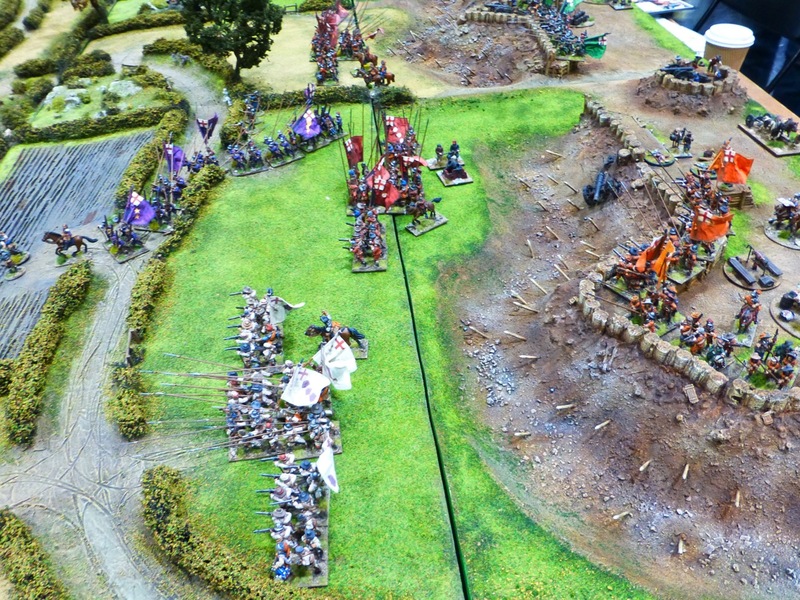 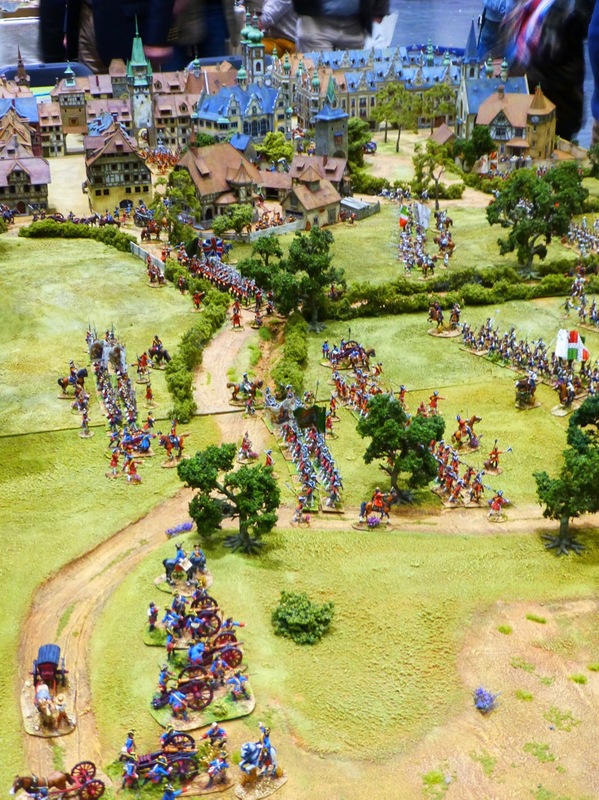 Maidstone Wargames Society created this epic conflict in 3mm scale.